Hi everone! I had been planning for quite a lot of time to make some projects, and finally a free weekend helped me publish it. Today I am going to show you how to make a cheap, lw tech, easy voltmeter that can give quite good readings of any battery's voltage. Sorry for any mistakes. 1) A cardboard of 7.5 * 7 inches. 2)A small but powerful magnet. 3)Magnet wire, the thinner the better. 4) A cardboard piece of 7 * 0.5 inches or a straw. Straw works better. 7) A paper clip or something similar. 8) some more scrap cardboards. For the base and structure of the voltmeter, we woul be using the cardboard. Use the guidelines on the Pdf or the picture to mark the cardboard. Cut along the bold lines, bend along the broken lines.It should look something like the picture given. Now take a 3 by 1 inch cardboard piece and make a hole at almost 1 cm away from the end. Then take the 7 by .5 inch cardboard and make a hole 2 cm away from the end. Take the 3 by 1 inch cardboard piece and glue it on the taller fold of the cardboard body as shown in the picture.Then following the hole on the cardboard, make another hole right behind it on the cardboard. Glue the magnet on the 7 by .5 inch cardboard. Take a small cardboard and make a bone shape on it, and start wrapping magnet wire around it. Coil at least 100 times. Tape the coil to hold it in place. Scrape off the insulation from the two ends. Take the paper clip, straighten it and cut a small piece from it. The piece shuld be at least 3 inches long. Step 8: Setting Everything Up! Take the cardboard piece with the magnet on it and put the cut out paper clip section through the holes on the cardboard body and the cardboard piece as shown in the picture. 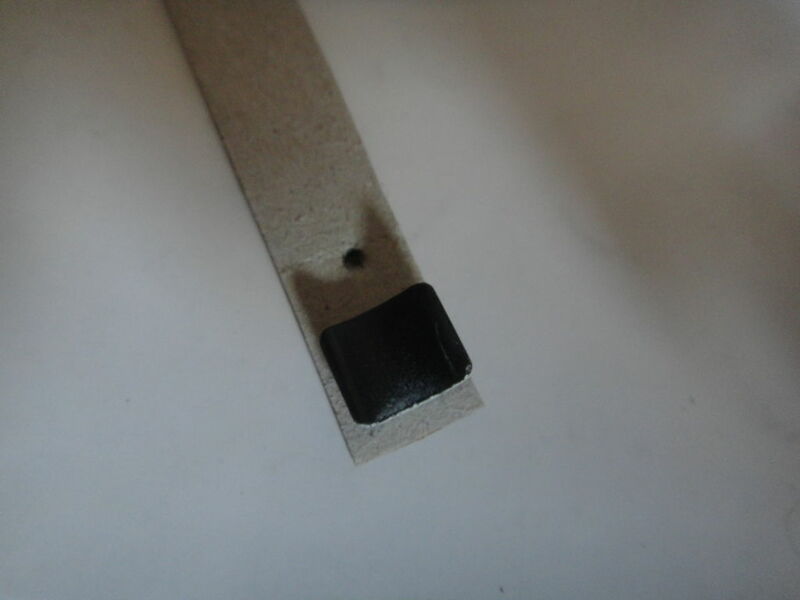 Now make sure that the carboard piece with the magnet moves freely and always stays perpendicular when untouched. Now take the coil of wires and glue it to the smaller fold on the cardboard body. Make sure if stays close to the magnet. Step 9: Testing It Out! To test it just touch the ends of the wire to a battery and the carboard piece with the magnet will start moving and would stay pretty close to a definite spot. Now take the wires off the battery and the cardboard needle will go back to its original position. Now test it with different batteries and see where the needle goes at different voltages. Mark it so that you can read the voltages later on. Step 10: So How Does It Work? The device has the three main parts, the coil, the needle with the magnet and the cardboard body. When electricity is passed through the coil of wire, the wire produces electro magnetic fields, and acts like a magnet. The wire then attracts the magnet and the needle moves. The more the voltage a battery has, the more powerful the field would be and so it would cause the magnet to be attracted even more, and the head of the needle will move more toward the left and it will indicate the increase of voltage. 1) If your voltmeter needle moves the opposite way, then flip the coil or the magnet. 2) If your needle does not move, then check whether the needle is to tightly placed to move or not. Make the hole for the axle or the paperclip bigger. 3) Check if you had made the coil all right, add more wires if necessary. Check whether the battery is dead or not. 4) Make sure the magnet is a powerful one. 1)Increase the coil for perfection. 2)Use stronger magnets and a straw. So that's pretty much it. I hope you enjoyed it, and comment if you have more ideas or any correction. Have a great time with this project!! What is the purpose of coiling over 100 times? The more coiling the more conductivity? By the way, I bought magnet copper wire at Radio Shack and connected wire to 9V battery, one way and flipped. I'm still waiting for a supermagnet on Amazon, but I tried the 9V electromagnet on refrigerator magnet and they didn't attract. You know what scares me? The copper wire doesn't even conduct when I connect Arduino 5V to LED to copper to GND! Can you give me any tips please? Thank you very much. Try to make the coil go closer to the magnets, and also try to use a good amount of wires to make the coil.. Try to make a D'arsonval meter movement now. They are a little better than a fixed coil.